Amaterasu is one of Itachi Uchiha abilities when he activated Mangekyou Sharingan, two others are Tsukuyomi and Susanoo. Amaterasu is generates black flames at his focal point that will continue to burn until the target is reduced to ash. Itachi reveal his Amaterasu when he and Kisame got caught by Jiraiya inside Frog stomach. Itachi used Amaterasu to make hole and run away. 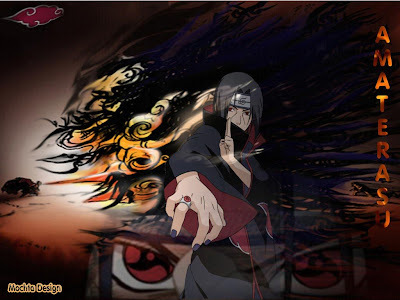 Itachi used again his Amaterasu when he was fight with his litlle brother Sasuke Uchiha. Before he dies during his battle with Sasuke, Itachi implants his Amaterasu in Sasuke's eyes, hoping that doing so will eventually kill Madara Uchiha. Wow so cool abilities from Itachi, but look like not only Sasuke which was given Amaterasu power by Itachi, but seems Naruto also got this Amaterasu and Itachi implants it through Naruto's dream. I'm not sure about that, its just my guess but I hope its true. it is not amaterasu this is fireball jutsu.amaterasu doesn't come from mouth. I didn't said its came from mouth.. is my wallpaper show Itachi release Amaterasu from mouth? chakra nature designates which techniques can and can´t be learned. Naruto has wind natured chakra (you can control multiple i know) which is the opposite of fire. so naruto can not learn amaterasu. also sharingan, nevertheless mangekyou is needed to activate the amaterasu, henchforth naruto is not eligable to use any jutsu of that sort, naruto is not an uchiha or an particulary smart guy so genjutsu?... no not naruto!